For most, crossing the street is an everyday task, but for Taylor Alexander, it’s a daunting one she won’t do without making sure it is completely safe to cross. 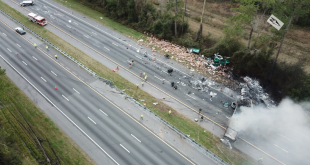 Alexander, a 20-year-old telecommunications major at the University of Florida, was walking across Southwest 13th Street in Gainesville to visit a friend at a sorority when a car struck her. Luckily, she only had minor injuries like scrapes and sore muscles after the incident. 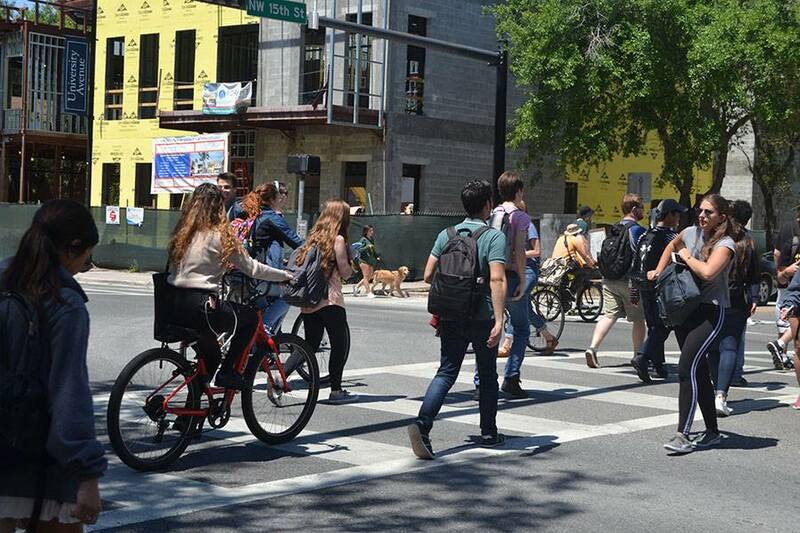 Florida is the most dangerous state in the U.S. for pedestrians, according to Dangerous by Design 2019, a report that calculated the total fatalities of pedestrians throughout the country. According to the report, 49,340 pedestrians were struck and killed by drivers between 2008 and 2017. Of these fatalities, 5,433 occurred in Florida, making up more than 10% of the country’s pedestrian deaths. The report also took the most dangerous metropolitan areas into consideration. Orlando ranked worst and had 656 fatalities from 2008 to 2017. In Alachua County, there is a lot of foot traffic around the UF campus, making those areas dangerous for pedestrians. 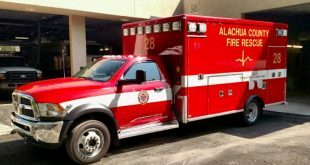 In 2017, 57 people died in traffic crashes in Alachua County. In Florida, pedestrians have the right of way on a marked crosswalk, and when crossing the road without a marked crosswalk, pedestrians must yield the right of way to the vehicles. West 20, an apartment complex on Southwest 20th Avenue, has no crosswalk for pedestrians trying to get directly from the bus stop across the street to their apartment. 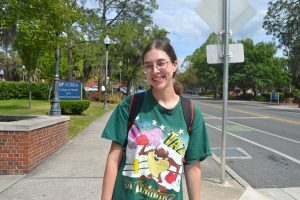 Emma Wedmeyer, a 22-year-old resident of West 20, was astonished to hear that 5,433 pedestrian deaths occurred in Florida. At night, she is more concerned for her safety while crossing this busy area of Southwest 20th Avenue. Kayla Brooks, a marketing manager at West 20, feels like there should be a crosswalk. She told the story of an 8-year-old girl named Layla Aiken who was struck and killed earlier this year in Fort Myers while she was on her way to her school bus stop. 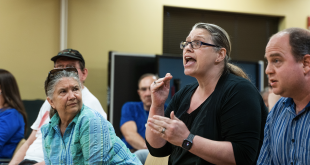 “This really hits home because my home community is coming together right now to fund benches with lights on them at every bus stop,” Brooks said. Cell phones are a common cause of distractions. Modern technology is considered extremely distracting and is one of the main causes of accidents in the U.S. and in Florida. If traveling at 55 miles per hour, it only takes five seconds to travel the length of a football field. “I think this goes back to the 1980s with people messing with their car stereos. I had two friends that were in severe accidents because they were trying to get their cassette tapes,” Skinner said. 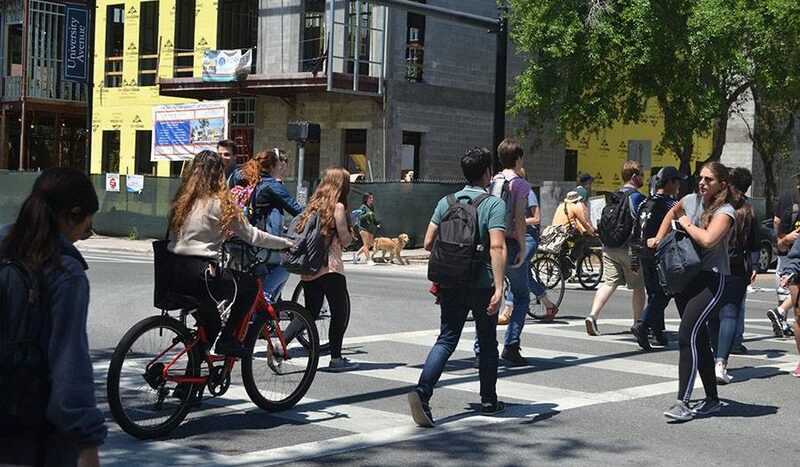 Vision Zero is a city program begun in 2018 that aims to eliminate fatalities and serious injuries on Gainesville’s streets. Part of this program includes lowering speed limits and installing traffic-calming measures in targeted locations and increasing the number of law enforcement personnel and enforcement efforts against dangerous travel behaviors. A smartphone application in development would buzz a pedestrian’s phone when the walking light changes from the red hand to the walking man, just in case they are not paying attention. Another application will alert drivers of when a traffic light is about to change so that they can be aware of their surroundings and check for pedestrians. Eve is a reporter for WUFT News who can be reached by emailing news@wuft.org or calling 352-392-6397.